Chessplayers are ofen used to solve more-movers like this: 1.Bxh7 Kxh7 2.Bxg7 Kxg7 3.Rg8 Kxg8 4.Qg6#. When such a solver-beginner first time tries to solve a standard more-mover, he does not know what to do at all. If he does not resign immediately, he performs several first half-moves which seem the best for him, and, then solves a shorter direct problem (I'm describing feelings of a solver in Pardubice, Czechia, 2003). Such a method contains first a 'help-part' ('performs several first half-moves which seem the best for him') and then a 'direct-part' ('solves a shorter direct problem'). Thus the idea of help-direct-problems was born: in the first part white and black help each other to reach a position, when black cannot prevent from n-mover. 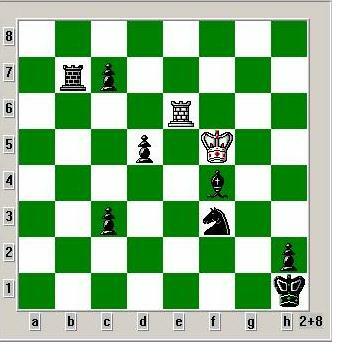 There is a direct analogy to a standard helpmate, where white and black help each other in the first part so that black cannot prevent from 'one-mover' (in the last half-move of white). There is also an analogy with an existing type of the problem: help-self-mate, where white and black help each other to create a one-mover selfmate in the last move (though there is no reason to restrict the selfmate to just one move). The definition of the help-direct-problem is the following: in help-direct-mate Hx-y# black starts to move, and x moves (minus one half-move) black helps white to reach a position, when (white moves, and) black cannot prevent from a standard y-mover. At the same time, the initial position must not soluble as a standard helpmate which has less halfmoves than a help-direct-mate. 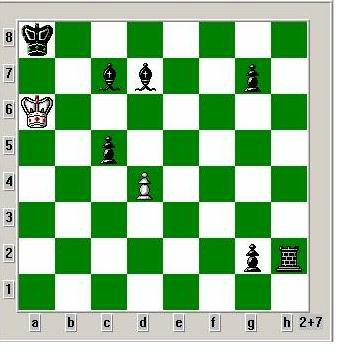 In H2-2# (3.1.1.2#) black starts, and after a next move of white and black there should be a standard two-mover on the board. At the same time, the original position must not be soluble as a standard H#2. 3.1.1.2# says that the help-part contains three ways how to reach any final two-mover. In the help-part during the first three half-moves the black pieces must be cleaned-up and white pieces must be setup so that the black ones have no possibility to make troubles to the white ones in the final two-mover. In H3-2# (2.1.1.1.1.2#) it is similar, just the help-part is two half-movers longer and there are only two solutions. The initial position must not be soluble as a standard H#3. As you can see from the previous problems, the contents of the help-parts is poor and the contents of the direct-parts is zero. Nevertheless, I believe, that real composers will be able to compose a help-direct-problem to be able to be called a problem. One more important thing. I do not know any solving program that could be able to test correctness of help-direct-problems. So please send problems without verification.If we find any incorrecntness, we will send you the problem back for a correction with an explanation. If you have any possibility to test correctness of help-direct-problems, we will be thankful for any info. - a direct problem is like a game with a friend. We both try to win. - a helpmate is like a game with a child. We help the child win. - a selfmate is like a game with a wife. We make her win so that she has to be kind to us even though she does not want to. - a help-direct-mate is like an education of a child. We spoil, spoil, and when we realize that the child is spoilt too much, it is too late for education.